Image: Colorful via Videocardz.com. Click for original. Embedded displays might be the next big thing that replaces (or at least supplements) RGB lighting. Case in point, Colorful, a Chinese manufacturer of graphics cards, just slapped an LCD along the side of its iGame GeForce GTX 1080 Ti. Don’t be surprised if other manufacturers follow suit. When it comes to gaming products, RGB lighting is everywhere—cases, graphics cards, peripherals, and even RAM. It looks nice when tastefully done, but can also be gaudy if going overboard. Maybe the same will be said about embedded displays one day. 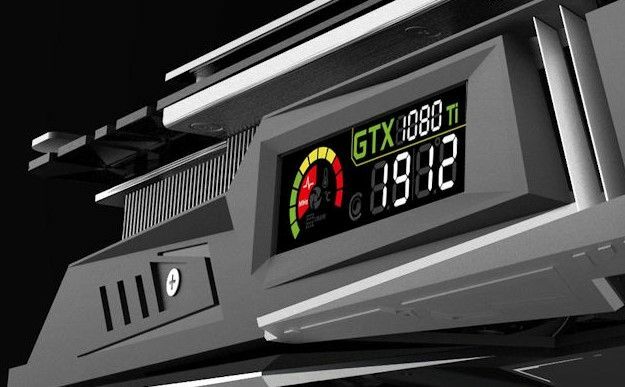 For now, Colorful is the only company we know of to equip a graphics card with an LCD panel. It’s mostly about the bling, though the screen does show certain vitals, such as the clockspeed, GPU usage, current temperature, and fan status. Beyond the embedded LCD, Colorful’s new card is notable for its 16+2 phase design. That should lead to cleaner and more stable power delivery to the GPU, which in turn could help with overclocking. The card also features a custom cooler with three 92mm fans underneath the hood. And of course LED lighting is present. According to VideoCardz.com, Colorful is planning to release the card next month in China. Will League of Legends ever conquer its support problem?